Even heat distribution. Cast iron distributes heat more evenly then any modern day pan. This makes for even baking (think biscuits), or cooking (Stir fries, skillet suppers, pancakes). Holds heat longer. This means less fuel for cooking is needed when using cast iron, which in turn saves you money. It also means you can use a lower temperature many times to cook with. Health benefits. Many doctors will actually prescribe using a cast iron pan for your cooking, if you are iron deficient. Some traces of this vital mineral are passed on into your food when cooking and can be a low cost way of boosting iron into your diet. 1) BUY YOUR CAST IRON: Scrounge yard sales for cast iron, but watch your prices. I found this little one at a yard sale for only one dollar, but many flea markets know how popular they are and can charge more in some cases than the cost of buying new, so think cheap and keep your eye open. 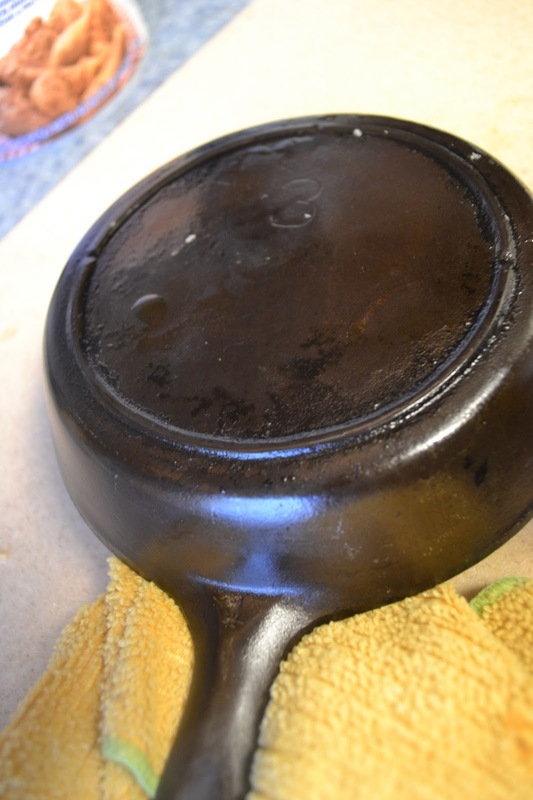 Dutch ovens, skillets, griddles, and bakeware (such as corn stick pans for cornbread) are all made in cast iron. Let me be perfectly clear : this will be the ONLY and I repeat ONLY time soap will ever touch this pan again! Soap will strip your seasoning and you'll have to re-season the pan. 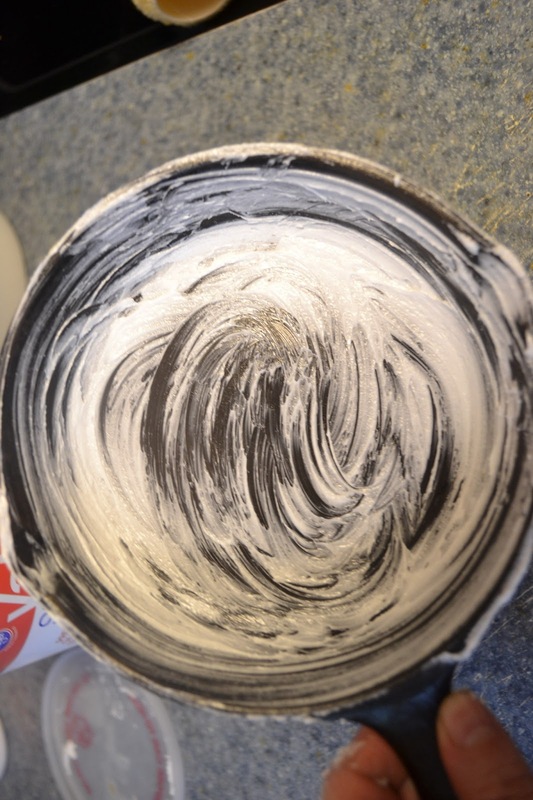 New Pans: the manufacturers have coated the pan with a protective coating, that MUST be removed before using the pan. 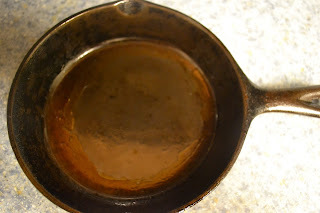 It will either be a food safe wax or a water solluble shellac.. Make sure you remove ALL of the coating, or the lingering bits of coating will smell when you cure the pan, sink into the pan and change the taste of your food, so scrub well, it's your only time to do this. 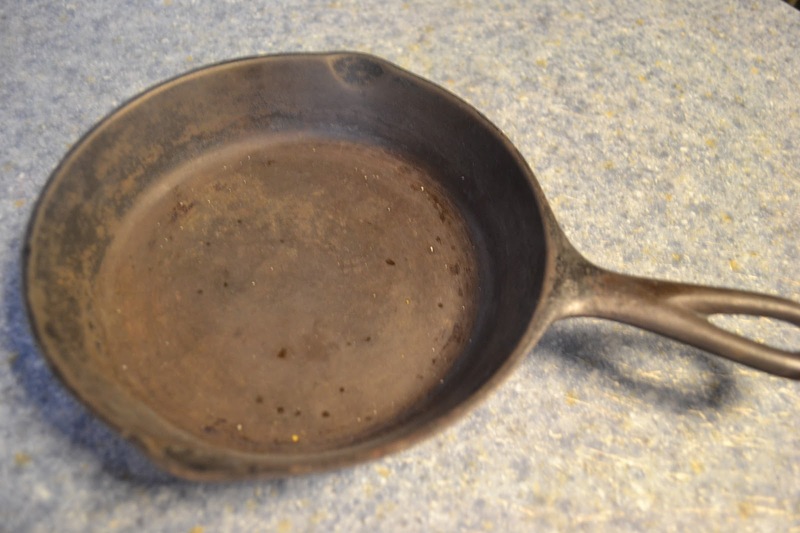 Used Pans: If you bought a used pan you may find some burnt on food, or even soap residue in or on the pan. You can burn off the food in the oven, but this is your only shot with soap so, scrubbing it clean as mentioned above is fine too. What is seasoning and why do we need to do it before using our pan? 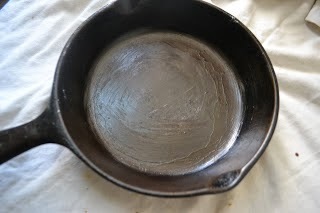 Mother Earth News explains this very well: Seasoning cast iron means filling the pores and voids in the metal with grease of some sort, which subsequently gets cooked in. This provides a smooth, nonstick surface on both the inside and outside of the piece. 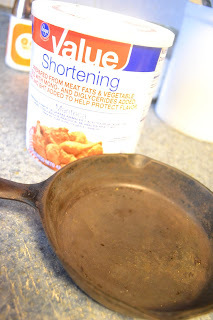 Using only vegetable based shortening, (no butter, margarine or animal based fats), wipe a liberal amount all over the inside and outside of your pan. Bake on a baking sheet for one hour. Blot up any excess oil. Don't worry if the pan feels slightly sticky at this point, that will go away before or at the first use. Just pulled from the oven after first curing. Repeat process again. Spread liberal amounts of shortening and season for another hour. Can you see that slight Brownish residue around the edge? onto the pan. It is perfectly ok, and will go away with use. Most manufacturers will recommend using your pans for frying food for the first couple of uses. This will help seal and cure the pan even more, so the perfect excuse for some home fried chicken or fries! 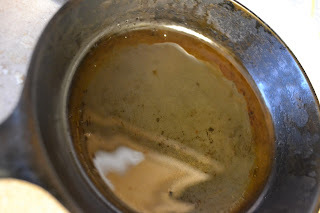 Next Post I'll teach you how to clean your pan (WITH NO SOAP)!